The VR League recently concluded its second season at Oculus Connect 5 with over fifty finalists across four featured games. VR Fitness Insider has shared numerous stories about people who are losing weight and improving overall fitness by playing VR games. Following the VR League grand finals, we caught up with three champions to hear their thoughts about the concept of using virtual reality for health and fitness. Palidore is a founding member of Eclipse, the team that won the VR League season 1 world championship title for Ready at Dawn’s Echo Arena and successfully defended the title in the VR League season 2 grand finals. Dr. Killinger and Smoils are members of Beginners, the team that claimed the VR League Onward grand championship title. Onward is a first person military tactical simulator created by Dante Buckley and managed by Downpour Interactive. Since season 1, tournaments have been organized through the VR Master League, but this summer the VRML collaborated with the VR League for a summer championship series. VRFI: Do you think VR esports can be a positive force for health and fitness? If so, do you have any personal examples? Palidore: I think VR and VR eSports can be great for health and fitness. It all depends on what type of content you’re playing and how much you put into it, of course. Personally, I’ve had countless physically intensive sessions with games like Echo Arena, Echo Combat, Beat Saber, and Thrill of the Fight that’d leave me exhausted and sweaty by the end of it. VR isn’t going to be a replacement for weight lifting sure, but as far as cardio goes, it can be a fantastic way to get gamers—whose medium is known for being a traditionally sedentary experience—physically active and engaged while doing something they enjoy. It’s a way to have tremendous fun, with exercise being a pleasant side effect! Dr. Killinger: VR (non-sim) games are certainly better than sitting down pancake games. In terms of exercise though, Onward mostly gets your heart-rate up through mental stress and exertion rather than physical. Smoils: Well, do not expect playing VR games to make you an athlete, but even doing sports won’t make you lose weight and get a perfect figure. Diet, good sleep and a bit of workout is required to be in shape and healthy. Any amount of movement and changing poses is better though than being stuck same position on your bottom barely moving a hand. VRFI: In regards to hydration, warm up exercises, stretching, etc. do you have any advice for people who are playing VR for fitness? Palidore: Depending on the game, VR can be physically demanding in some of the same ways traditional exercise and sports can be. Playing a game like Echo Arena, it’s not uncommon to hear of players straining their shoulders or developing tennis/pitcher’s elbow from the repetitive throwing motions you perform in the game. I admittedly don’t stretch before playing as much as I probably should, but it’s definitely something people should take into consideration. For me, hydration is a big thing I focus on. Given the physical intensity that goes into playing VR eSports and the hotter climate I typically play in, hydration is so important towards maintaining energy and mental clarity. It’s easy to get lost in the action and stimuli of VR and forget to hydrate (or even eat! ), but it can have a noticeable negative effects on your play if you don’t. I try to remind myself and my teammates to drink between games as often as possible, to keep performance high. Dr. Killinger: Personally I don’t physically warm up or stretch before playing, but maybe I should. And I remember many times coming out of the map or match really dehydrated and wanting to drink, especially for the more stressful ones and for long tournaments, so having some water nearby is pretty important. Smoils: Do Not Use Wrist Weights!! It’s an easy assumption to think you might enhance your VR workout using some weights and they do sell nice small weights you can strap to your hands, but it could do more harm, even irreversible harm, than good. Just moving a lot, playing Beat Saber for example, is already a great cardio workout so you don’t need weights. Hydration is important always. VRFI: Do you believe VR social games and communities can help with mental health as well as physical health? If so, how? Palidore actually wrote about his experience recently and discussed how playing VR esports has helped him overcome depression. Dr. Killinger: Yes. It’s not a cure probably, but Onward, for example, has a great community. And just playing a good game with good people raises the mood. Talking to people from various parts of the world must also be pretty good for you! Smoils: Oh yes I do. VR will be an amazing way to meet new people. For people with mental illnesses, disabled people with mobility problems, and even just old lonely people, it is already helping in that regard. The future is bright. 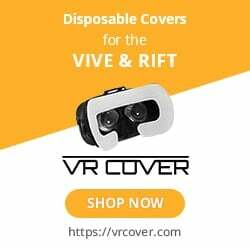 VRFI: Have you ever been injured playing VR games? If so, how were you injured and what could you have done differently to avoid injury? Palidore: The only injuries I’ve had playing VR have been with Echo Arena basically, and most of them occurred in the first 6 months of playing it. I had issues with a pinched nerve around my shoulder area that would flare up every few weeks for a while, along with some lower back pains. I’m happy to say though that, perhaps due to being better conditioned, I haven’t experienced those things much in 2018. I have jammed my fingers a good handful of times, and even have a bone spur in my index finger after smacking it particularly hard on the edge of my desk once upon a time, before I expanded my playspace. The worst I deal with these days is punching my low ceiling every now and then, but otherwise, injuries aren’t too bad or frequent anymore. Dr. Killinger: I know a few people who have broken their fingers or teeth due to having things you can break them on dangerously close to their play space. I also remember in the early days hitting a wall myself a few times. So I guess my advice is to be conservative with your chaperone/play-space setup. Smoils: I have hit my hands on walls several times throwing grenades in Onward or playing Gorn, but it’s partly my own fault for disabling guardian/chaperone walls and not paying attention to my middle playspace marker. Having a center marker either in game settings, using advanced settings mode or turn signal software helps a lot too. You need to be aware where the middle of your room is at all times. VRFI: Do you have any words of encouragement for people who are on the fence about whether to invest in a VR setup? Palidore: For those who haven’t experienced high-end VR (accurate, fully-fledged head and hand tracking is a must! ), or those who might not know what VR is about whatsoever, let me just tell you that it’s a literal dream come true for me and for many kids at heart. For anyone who grew up and found themselves being immersed in video games, books, or movies, and imagined being able to “jump” inside those worlds, meet those characters, and live out those stories for real—VR enables exactly that. It brings the fantastical to life, allowing the user to feel almost physically present in a new place entirely, whereas before, the best we could do was close our eyes and imagine. The feeling of putting on a VR headset and being transported to different worlds or universes is a simply magical experience, and it’s what makes virtual reality the ultimate immersive medium. With applications that extend from entertainment to education, athletics, tourism, therapy, and more, I have zero doubts that VR will end up being regarded as one of the most important and influential technologies of the 21st century. Dr. Killinger: With VR, you really are there. Everyone should definitely at least try it (on a good HMD with tracked controllers) if they have a chance. And Onward league play is really special for me. I wasn’t even really ever that interested in FPS or any esports before VR and Onward, but right from the first unofficial tournament in November 2016, I’ve been hooked since. Regarding the first excuse, the Rift is quite cheap lately, but it’s true you need a beefy machine to run games for it (plus additional expenses on cables and more sensors if you want to play games more seriously). I’d say if you have a gaming PC, just buy a Rift and try all kinds of games. One problem is that people with Rift games is that a person might try one game and feel like it’s not worth it, but every person has a game that clicks for them. Some prefer shooters, some space sims, flight sims, racing games or just social applications. You need to try different things. Personally I was worried my Vive would just be collecting dust on a shelf after the initial “VR wow” wore off, but Onward clicked for me. As for looking silly – you look silly while you eat. You should not be ashamed of yourself while having fun!